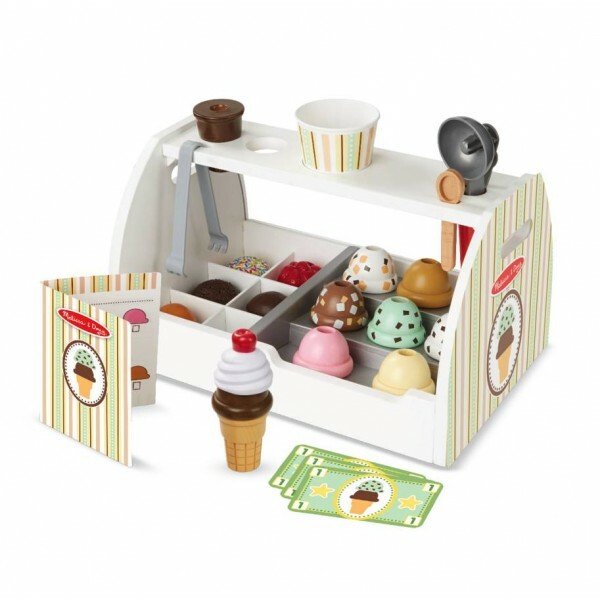 Scoop up some cool treats with this all-inclusive, twenty piece ice cream counter! The sturdy wooden tabletop counter holds eight wooden scoops of different-flavoured ice cream, six assorted toppings, two cones, a plastic cup, an ice cream scooper and a wooden spoon. Take orders on the reusable menu card and serve up some delicious fun! It's a product that will help develop fine motor skills and hand eye co-ordination, as well as imaginative and co-operative play. There's loads in the box, which means everyone can share in the fun, even if you have lots of children to entertain. The Ice Cream Counter is sturdy and exceptionally well made, making it a product that will stand the test of time.